So apparently it’s June. And maybe you’re in a part of the country that’s been having more summery, balmy weather than we have had here in the Bay Area. Maybe you’ve already been grilling and have bought yourself a new pair of flip-flops. Because I know it’s happening out there. I’ve been eyeing some sweet J. Crew sandals myself and am thinking about swimsuits, soft-serve ice cream and canoes over the 4th of July weekend. But right here, right now at my little school-house desk, I haven’t been seeing too, too much of that. 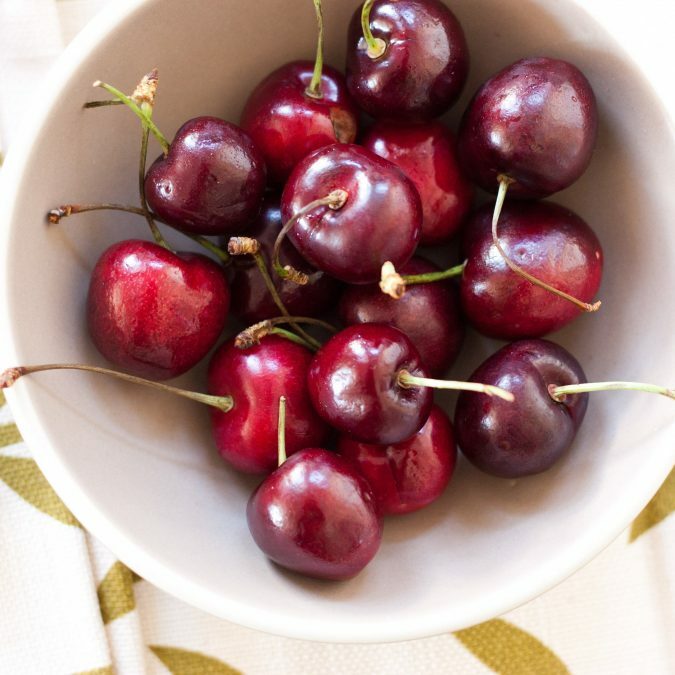 Although hey, we’ve got cherries (even sour cherries at the market this weekend! ), beautiful berries, and early peaches. I found myself ordering an iced coffee yesterday afternoon and am even fitting in runs in the later part of the evening. And as I’m writing this at 9 p.m., I’m having a simple dinner of heirloom tomatoes sprinkled with sea salt, roasted chard, and a poached egg. So it’s happening. Certainly. We just have to remind ourselves to step back from our little school-house desks to see it unfolding. Because summer, of all the seasons, always seems too brief and fleeting. It’s the time of year when we can let stringent obligations slough away just a little, when we can walk around barefoot and lounge outside doing nothing but people watching, cocktail sipping, magazine reading, stargazing, daydreaming, napping. So let’s not let that slip away, o.k.? Today I bring you a dessert that will help you usher in summer’s quiet entrance in the best possible way: the easiest way. This is a simple dessert that celebrates summer fruit by putting it front and center. Now a clafoutis isn’t something I’d necessarily make for a big dinner party or to impress a pair of out-of-town guests. It’s a relatively humble, unassuming dessert that lies somewhere smack in between a custard and a pancake. It’s comfort food. It’s summer evening after a little Proseco food. It’s relish-the-season-while-we’re-smack-dab-in-it-food. Because what’s left after a quiet entrance? A moment to dive right in. For this recipe, I added a smidge of almond extract because it works so nicely with the flavor of ripe cherries. And I used half barley flour as it has a nice, almost creamy quality that compliments summer fruit so well. If you have sliced almonds on hand, they would be lovely sprinkled on top. I’ve also made this recipe nestling a layer of cocoa nibs on top of the cherries and it was fantastic. 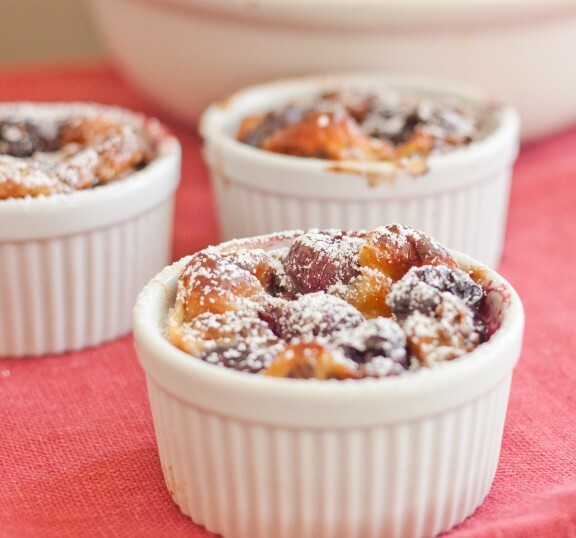 Preheat the oven to 350 F. Choose 8 ramekins or a large 10″ cake pan or casserole dish to bake your clafoutis in and butter the bottom and sides liberally. In a medium bowl, whisk together the eggs, flours, sugar, vanilla and almond extracts and salt. Set aside. Combine milk and cream in a small saucepan and bring to a low simmer (don’t allow it to fully boil) over medium-low heat. Gradually pour the milk mixture into the egg mixture and whisk until the batter is smooth. 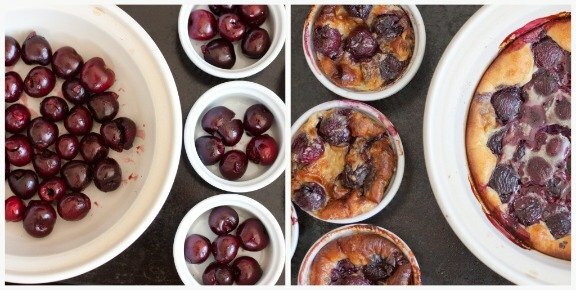 Pour batter evenly over cherries in the pan and bake until the top is golden brown and the middle is set, about 30 minutes for ramekins or 40 minutes for larger cake pan. Let cool completely, then run knife around pan to loosen, dust with powdered sugar, cut into slices and serve. Beautiful post. I'm laughing because the heat just went on in the house. Last week it was 100 degrees, today...not so much. You're absolutely right though, we can't waste it. I've never tried clafoutis but definitely will after seeing your recipe. Here's to summer. It's good to know no matter what season it feels like, we are still going to get our summer berries. I passes through spring and summer four times on the way to work this morning. After four weeks of directly from winter to summer, I think spring has finally arrived here. With June gloom, LA hasn't felt much like summer either. But I'm waiting for it in anticipation, and when it finally does show up I'm prepared to take full advantage. 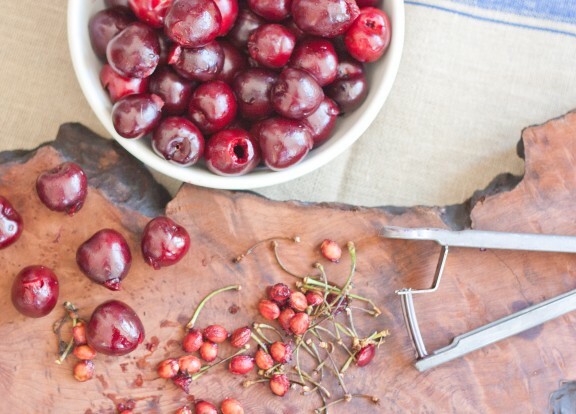 Nothing screams summer quite like cherries. I also love the addition almond and barley flour. I know, Adrianna! We'll just have summer longer than everyone else...that's what I keep telling myself anyway. Nicole: So happy you're seeing the seasons change there, too. Finally! First, those sandals are gorgeous. Second, the dessert looks amazing. I still have never had clafoutis, and I've never made it myself. Clearly something is wrong with me. Clafoutis never disappoint me, and the custardy goodness is the perfect complement to every summer meal, every summer fruit. Cherries are the classic choice. Gorgeous photos, Megan - pop off the page. Get those sandals. Thank you, Mary and Katie for the photo compliments. Wasn't hard to make those cherries look good. And yes, sandal encouragement always welcome. I agree with Mary--such warm, beautiful photos! And that clafoutis looks pretty good, too. This truly sounds delicious. I am curious now about the barely flour. It is a grain that I just simply have never thought to grind. I must try it alongside some almonds and fruit as you have suggested. oooh I love that you made these mini! I didn't realize they could be. These look tasty and those sandals are super cute. A clafoutis is the one Summery dessert I've yet to bake. I always end up going with a crisp or cobbler, but I'm going to have to try this as soon as cherries arrive here in WA! i love clafoutis! my favorite desserts are always fruit based with some type of light and/or eggy batter atop...i find them so refreshing and satisfying at the same time - hard to say the same about chocolate! i do think for company these are darling too - the individual ramekins are a nice touch. happy summer!!! Wow! I also had cherries, berries and peaches at the Farmers' Market this weekend. I had no clue what to do with the cherries, so I'm delighted to have found this recipe. The pictures are just beautiful!